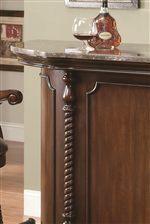 Rope trim details at stately elegance to this traditional bar stool. Scrolled arms and dark vinyl on the back and seat are accented with nailhead trim to complete its look. This bar stool is ideal paired with the matching bar unit. The 100670 Traditional 29"H Bar Stool by Coaster at Wilcox Furniture in the Corpus Christi, Kingsville, Calallen, Texas area. Product availability may vary. Contact us for the most current availability on this product. The 100670 collection is a great option if you are looking for Traditional furniture in the Corpus Christi, Kingsville, Calallen, Texas area. Browse other items in the 100670 collection from Wilcox Furniture in the Corpus Christi, Kingsville, Calallen, Texas area.